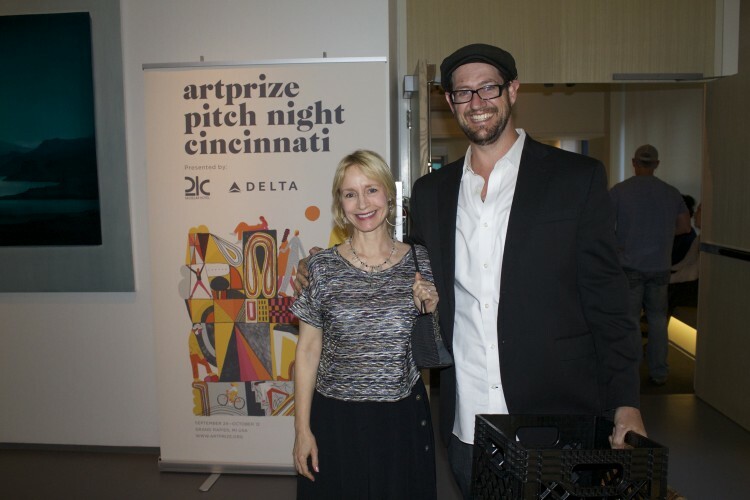 GRAND RAPIDS, Mich., May 23, 2014 – ArtPrize, the radically open international art competition in partnership with 21c Museum Hotels and Delta Air Lines, announced Joe Girandola as the winner of the first annual Pitch Night Cincinnati. Girandola will be awarded $5,000 to install the winning proposal at ArtPrize 2014 and will compete for the $560,000 in prizes awarded at the sixth annual event. Joe Girandola was selected from five finalists invited to present their projects at tonight’s event at the 21c Museum Hotels Cincinnati location. Each artist had five minutes and five slides to sell their idea to a panel of five local arts professionals, including Cincinnati Art Museum Director Aaron Betsky and 21c Vice President and Museum Director Alice Gray Stites. The Cincinnati-based artist and Director of the Masters of Fine Arts program at the University of Cincinnati will install his arch made of 1,826 milk crates in Louis Campau Promenade, a high-traffic, outdoor venue, on the site of Grand Rapids’ original milk house and trade center established by Louis Campau in 1826. The Promenade offers a blend of historic and modern buildings and gardens spanning from the Grand River to the heart of Downtown. ArtPrize launched Pitch Night in 2013 at the Walker Arts Center in Minneapolis to discover exciting, visionary projects and reduce the barriers out-of-state artists encounter in bringing them to the ArtPrize event. New for 2014, ArtPrize expanded Pitch Night to Cincinnati, Ohio in partnership with 21c Museum Hotels, a unique combination of boutique hotel, contemporary art museum, and cultural civic center. Pitch Night Minneapolis will return for its second year, in partnership with the Walker Art Center and mnartists.org. On June 26, five artists will compete for $5,000 and the opportunity to install their creation on the Gillett Bridge during the 2014 ArtPrize event, September 24 to October 12.